... but because just one month later, one of China's biggest corporate-debt defaults hit, with the collapse of a coal mining giant that had taken advantage of China's wave of cheap and easily accessible credit until Beijing once again changed the game with their aggressive deleveraging campaign, which sent shadow credit creation crashing to record lows just last month. 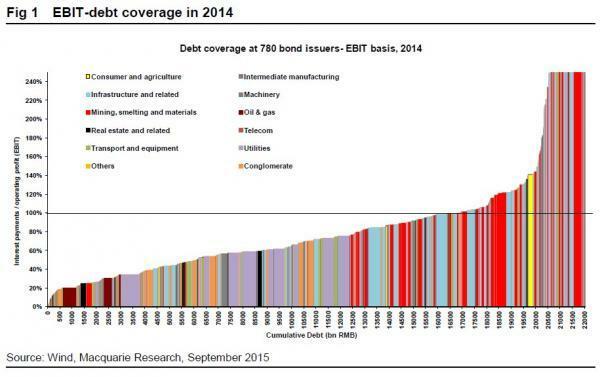 But before we go into the details, a reminder what we wrote in October 2015, when we showed that when credit was easily available, more than half of China's commodity companies were unable to pay the interest on their debt as their EBIT/Interest ratio was <1. As we noted at the time, all it would take is another down cycle in commodity prices for mass defaults to become a staple in China's massively overleveraged economy. And for investors in China's Wintime Energy, that time is now. 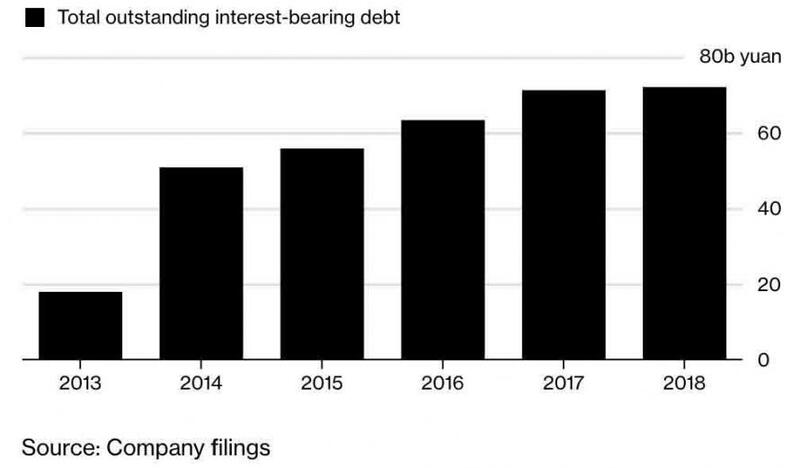 To be sure, for a long time, it was smooth sailing for the coal miner: as Bloomberg reports, the company from northern grew and grew and grew, but mostly thanks to an unprecedented increase in its debt, which quadrupled in less than five years, ending up with a debt tab of 72.2 billion yuan ($10.8 billion). The surge in Wintime debt came amid a near-doubling in size of China’s domestic bond market, now roughly $12 trillion and the world’s third largest. The government had encouraged companies to use bonds for financing as they embraced financial innovation to make the economy less dependent on state-owned banks. 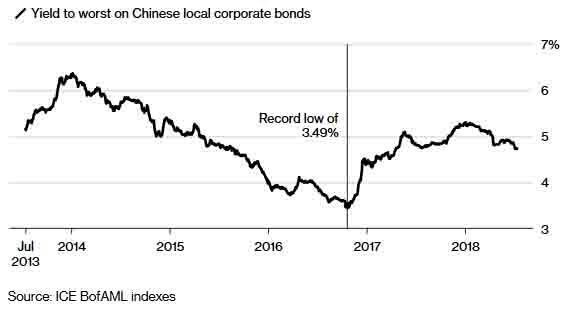 Alas, the debt-fueled party is now over, and the company had no choice but to default after it was unable to rollover its debt, an event which to Bloomberg "illustrates why this year will be China’s worst yet for corporate defaults." Initially, Wintime’s strategy made sense: borrow to fund acquisitions and expand into areas including finance and logistics. And as long as borrowing costs were low, funding was easy to get and the miner took full advantage of creditors’ largesse. However, things changed in 2016, when President Xi Jinping relaunched an aggressive deleveraging campaign, and put emphasis on reining in financial risks, after China's first great attempt to reduce debt crashed and burned in the summer of 2013 when overnight funding costs exploded and nearly took down the country's financial system. Fast forward to July when Wintime became the largest bankruptcy in China (so far) in 2018, when it defaulted on 11.4 billion yuan of debt after it failed to pay a local bond this month. That said, it will hardly be the last because as we showed recently, through the end of May, there had already been no less than 20 corporate defaults, involving more than 17 billion yuan, a shockingly high number for a country which until recently had never seen a single corporate bankruptcy, and a number which prompted not only Chinese banks to pull back from lending to other firms that use the funds to buy bonds, but also last night's PBOC easing response. "There was little need for due diligence until China began allowing defaults in 2014." 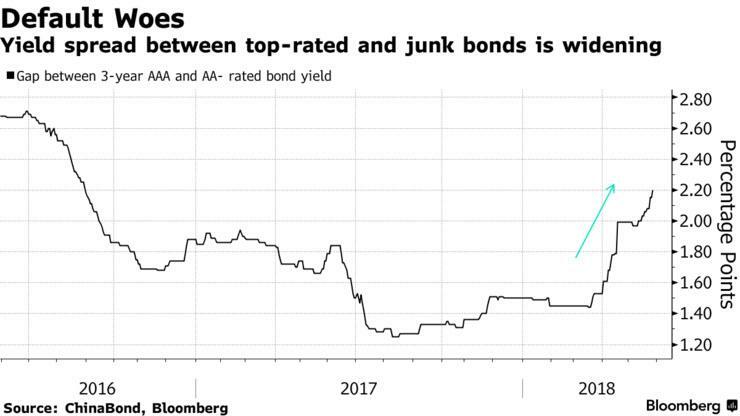 Which is a problem because as Qin Han, chief fixed income analyst at Guotai Junan Securities, wrote, "China’s economic growth was largely driven by debt and its corporate debt looks like a Ponzi scheme." Qin also predicted that absent a government intervention, an avalanche of defaults is coming as "more firms may give up on repaying debt if they encounter financing difficulties." Which they are: because with authorities taking measures to curb leverage by clamping down on shadow financing, boosting money-market borrowing rates and tightening regulations on the asset management industry, companies are increasingly running into those - and more - difficulties. 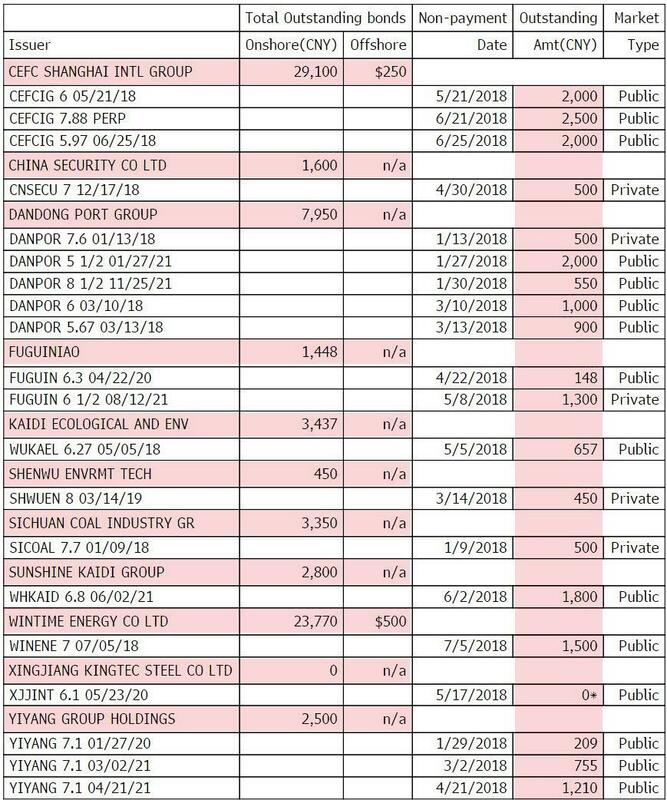 Nowhere is it easier to see the changing nature of China's "Ponzi" corporate debt history than in the financing efforts of Wintime itself, which after issuing more than 10 billion yuan of bonds in 2016 and again in 2017, was only able to find buyers for 3.6 billion yuan so far this year, according to Bloomberg data show. Why? Surging interest rates of course: Wintime's borrowing cost for one-year bonds soared to 7% in 2018 from 4.5% in 2016. The party officially ended on July 5 when the company admitted it would not be able to meet its obligations and Wintime defaulted on a 1.5 billion yuan note, triggering cross-defaults on 13 of its other bonds totaling 9.9 billion yuan. Of course, angry stockholders have been left in the void, with shares suspended from trading from July 5. 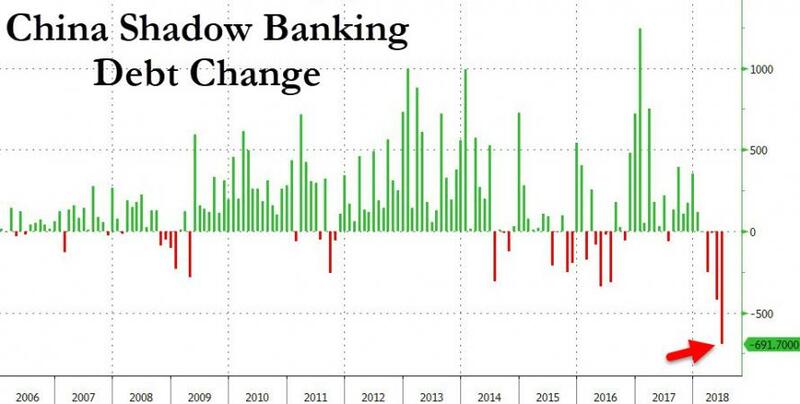 Recall that just last week we warned that China was threatened by a "vicious circle of panic selling" from marketwide margin calls, as a result of the massive amount of stocks pledged as loan collateral, which according to some estimates is as high as $1 trillion and represents an aggressive means of obtaining funding - one that is constantly under threat of margin calls - and as a result is increasingly under scrutiny in China. .
As it turns out, Wintime was also a poster child for its involvement in share pledging: Wintime Energy’s parent as of the end of March had pledged almost all its shares in the subsidiary as collateral for loans, according to public filings. And now that the shares are not only worthless, but also halted, those counterparties who expected to be repaid in full, or even in part, are out of luck. Of course, the scrambling parent has made some progress in obtaining credit lines to repay its stock-pledged by signing a strategic cooperation agreement with five banks including China Development Bank and China CITIC Bank. But all that would do is kick the can: after all at this point the company is using debt to repay another piece of debt, one which is for all intents and purposes worthless. Furthermore, the new credit line may have little impact on the ability to repay debt, if lenders impose strict covenants and seek assets for collateral. With Wintime down, bond investors want to know where the default wave will strike next. Unfortunately, there are plenty of of targets: the average debt-to-common equity ratio at listed companies in China climbed to 100% at the end of 2017, the highest in more than a decade, according to Bloomberg. The problem is three-fold: i) as a result of the recent emerging market swoon and commodity bear market, indebted companies are suddenly generated far less cash which puts them at far higher risk of default, ii) Chinese coprorate debt is up against a shrinking financing universe: the shadow-banking sector contracted by 691.7 billion yuan in June, the biggest net monthly drop on record, and iii) rates for deeply indebted companies have been rising sharply. ...to support the local bond market and banks, especially those that have invested in bonds rated AA+ and below. In other words, the central bank confirms that China's debt mountain is indeed a Ponzi Scheme as the Guotai Junan analyst explained, however instead of this particular bubble to burst - something it can not afford to do as it would risk widespread public dissent and anger - the PBOC decided to do the only thing it could: kick the can, again. We give the last words to Gary Zhou, director of fixed-income at China Securities International, who said that "financial institutions were too generous in lending to firms a few years ago but not anymore. Lower investor demand is now met with huge maturity wall. Investors should watch out for default risks and how restructurings are done." They should, unless the PBOC disintermediates banks entirely, and proceeds to buy near-insolvent corporate debt directly on its account, in line with what both the BOJ and ECB are doing. Last night's news confirms that this is precisely what the central bank is doing.